Predominantly 18th century with earlier fabric and later alterations and additions (see Notes). 3-storey 4-bay gabled building set back from street with small garden to front. Random rubble with polished dressings. Steps with shaped iron railings to timber-panelled entrance door at 3rd bay. Large rendered 2-storey lean-to extension and further single-storey additions to rear (circa 2000). INTERIOR: some internal doors and fireplaces of mid 18th century type. Timber stair to attic with turned balusters. Roof space with timbers of 18th century origin. Suite of oak furniture carved with thistles (circa 1950) in Chapter Hall (see Notes). 12-pane glazing in timber sash and case windows. Grey slate roof. Stone skews. End stacks. Clay cans. BOUNDARY WALL, GATES AND RAILINGS: low, stone-coped, squared and snecked rubble wall enclosing front garden with cast-iron railings and decorative 2-leaf wrought-iron gate with painted shield (see Notes). No 21 St John Street is an interesting mid 18th century building, formerly part of a narrow tenement running S from the Canongate. Survey work in 2001 revealed the building to have earlier 17th century origins with five phases of subsequent alteration, most notably around the time of the laying out of St John Street in the later 18th century. Evidence of earlier openings remain at 1st and 2nd floors to the street-elevation, indicate that this was probably a 5-bay, 2-storey structure, later raised to 3. Another three-storey structure is known to have existed to the rear. The South gable was largely rebuilt during consolidation work by Simpson and Brown architects in 2002. The building houses the Chapter Hall, Council Room, offices and library of the Order of St John in Scotland. It was gifted to the Order in 1970 at which time alterations including the rear extension were carried out. The oak furniture in the Chapter Hall was brought from the previous Chancery in Woodlands Terrace in Glasgow. The railings and gate were gifted to the Order in 1982. 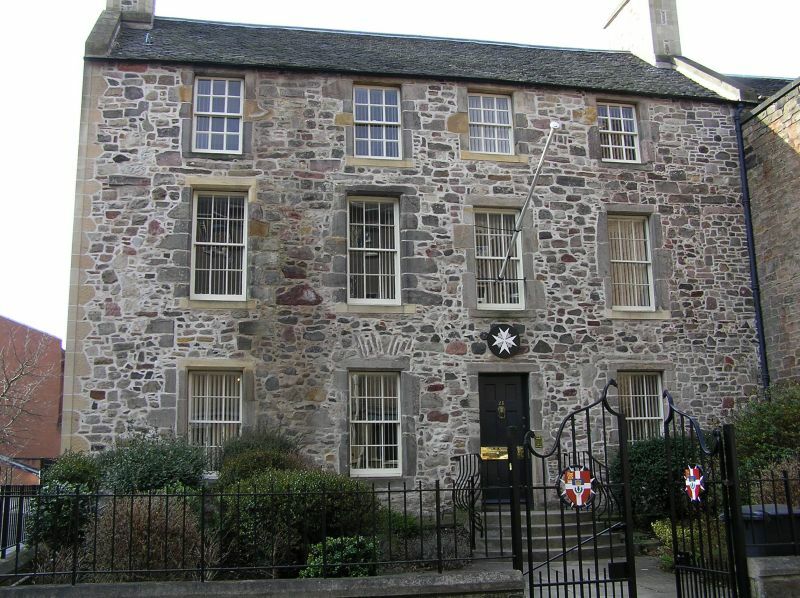 The building stands in an area associated with the pre-Reformation 'Knights Hospitaller' who were forerunners of the current Order of St John, at the site of St John's Cross in the Canongate. St John Street was laid out as a private street circa 1768 when a terrace (now demolished) was built on the E side. At that time, the land belonged to Lord Wemyss, who had a house nearby to the S.